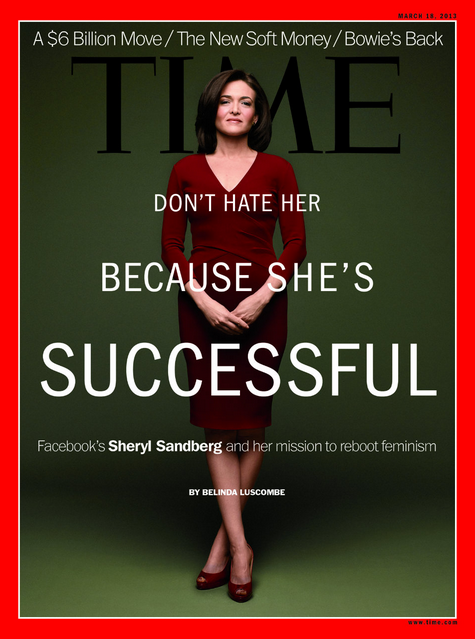 A big distinction here: This week's Time Magazine cover with Sheryl Sandberg on the cover was posed. Such is the case for most Time covers. The body language in this or any posed situation - rarely conveys the true real emotional mindset of those being photographed. The image chosen for the cover incorporates one of the worst possible nonverbal configurations. The body language used here projects a message which is the complete antithesis of the article within the Magazine - as well as that of Ms. Sandberg's book which went on the stands yesterday. It's truly hard to believe that this was the image chosen for this particular article. In Ms. Sandberg book, "Lean In", she says, "We hold ourselves back in ways both big and small, by lacking self-confidence, by not raising our hands, and by pulling back when we should be leaning in." There's no leaning in here folks - rather it screams, "Pull Back!" The Facebook COO's hands are being held in front of her lower pelvis. For both women and men this is known as the "Fig Leaf" position or "Genital Guarding". It indicates a low confidence, beta emotional mindset and vulnerable. With the exception of funerals, weddings and sometimes in the presence of superior leaders or other similar ceremonial scenarios - a leader should never adopt this position. And assuming this configuration will engender a LESS assertive emotional tone. The entire gist of her book is for women to become more assertive and being so isn't a bad thing or weak - rather it's great, it's strong and it's needed. Ms. Sandberg's legs are crossed just above the ankles. This nonverbal signifies a closed-off mindset, demure and timid affect. This is how children stand when they LACK confidence and they believe they're not good enough to be picked when choosing sides in the school yard or in the class-room. Adults often stand in this manner as well. It very literally says, "I lack confidence". This is not about "looking masculine" - it's about confidence, real assertiveness and sending an accurate and consistent message. Ms. Sandberg is a brilliant woman. She's very accomplished and a great leader. After seeing her interviewed several times - I can also say both her sincerity and her empathy quotients are sky high. She deserved a much better cover. More succinctly - the body language here is not representative of or consistent with the written message - it's a light-year off the mark. The article is well written. Time's (or any other) professional photographers take great technical and artistic images. Spouses or friends may indeed like them. Magazine editors & senior staff pick the ones they want from a choice of many images for internal photos and the cover shot. But here - and very often, such photos send the completely wrong messages. The same thing happens in a myriad of advertising and marketing scenarios. This is corporate self-destructive behavior. Why shoot yourself in the foot? Please stop. Do your homework. Nonverbal Communication Analysis # 1865: Five Presidents in the Oval Office - Who has the Lowest Confidence? Who is the Least Comfortable?